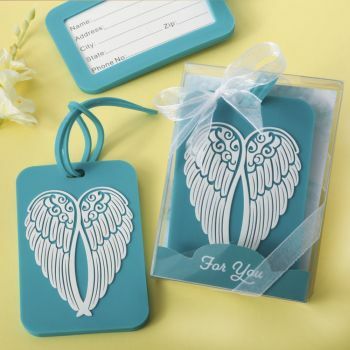 Offer your guests the Love and Guidance of a Guardian Angel when they set off on their travels. These beautiful luggage tags are useful favors that are guaranteed to be used. The luggage tag is made of rubber in a turquoise color. It is decorated with a detailed white Angel Wing design in a modern graphic style. A blank luggage tag is included and allows important information to be recorded such as name, address, city, state, zip and telephone number. There is a sturdy rubber hanger strap to attach to your luggage. The luggage tags come individually packaged in an acetate box. The box has a heavenly-design stage and is wrapped with a white organza ribbon and bow. There is a turquoise 'For You' message. A useful favor that is guaranteed to be used by your guests!